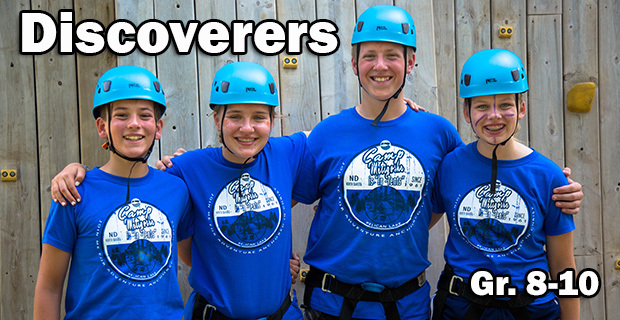 Your camp experience will include an extreme adventure on the high ropes course. A high ropes course is an obstacle course 30 feet in the air. You and other Discoverers will build incredible bonds of trust and friendship. Your course experience will be unforgettable; you will leave camp with new confidence, lasting relationships, and deeper faith. Enjoy cabin-group, overnight adventures and cooking some of your own meals over an open fire! You’ll experience all the traditional favorites – games, hoot-n-anny, Pelican Lake, campfires, but you can bet on new twists provided by the coolest counselors. You’ll bond again with your old camp friends and make new ones, too! Your faith will grow through deep conversations under the stars and energy-filled worship by, or even in, Pelican Lake.